Our local member Kay Harris, along with Alan Short’s phenomenal dedication and commitment, have taken the Bridgend Against the Bedroom Tax initiative, initiated and supported by us and Plaid Cymru, and developed it with the help of our good friend, Jamie Insole, WGP’s Elspeth Parris and Katy Beddoe and others, into a hugely successful campaign across South Wales. 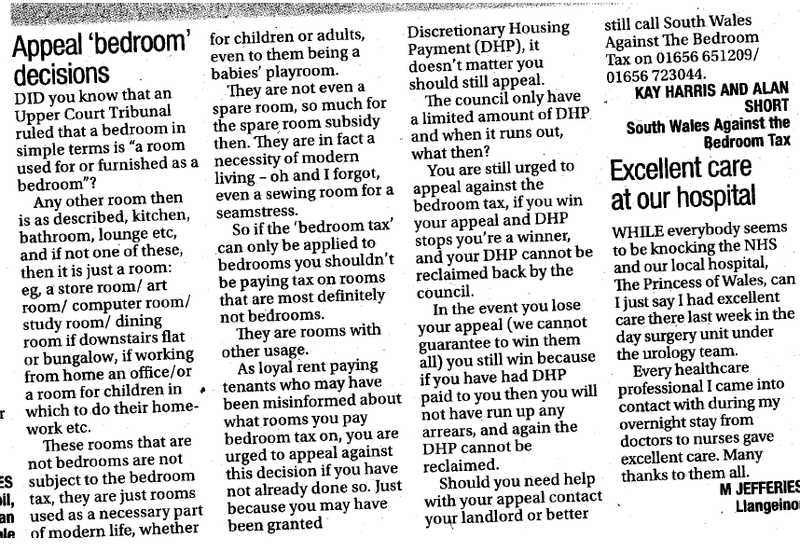 This letter appeared this week in the Glamorgan Gazette, South Wales Echo and associated peers across South Wales. This entry was posted in Uncategorized on November 8, 2014 by Bridgend's Green Leftie.